Pope Francis will have a full schedule of activities during his first major international trip in July 2013. The schedule of his trip to Rio de Janeiro for World Youth Rio2013, includes Protocol Events, such as the meeting with the President of Brazil, Dilma Rousseff (photo), along with visits to a favela, a hospital, and a visit with young inmates. 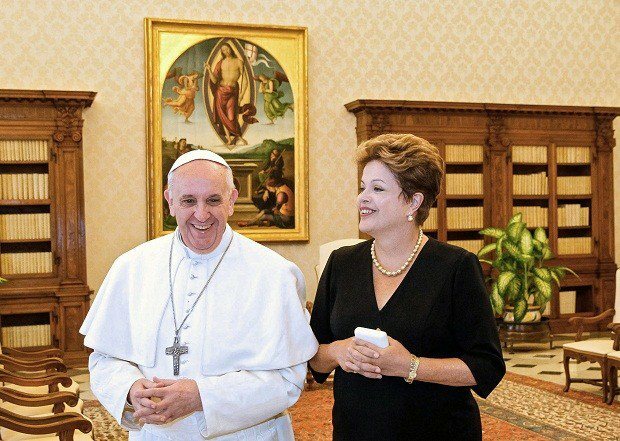 The Pope will arrive in Brazil on Monday 22 July. The official reception will be at Rio de Janeiro’s International Airport, at 4pm. Soon after, there will be a Papal Welcoming Ceremony in the garden of Palácio Guanabara, where the Pope will give his first speech. At the event, there will be a ceremonial reception of the three branches of government. The welcome committee will include President Dilma Rousseff, as well as the Governor of the State of Rio de Janeiro, Sérgio Cabral, and the Mayor of Rio de Janeiro, Eduardo Paes. The Holy Father will stay at the Residência do Sumaré (Sumaré Residence) during his trip to Brazil. The residence was where Pope John Paul II stayed during his two visits to Brazil in 1980 and 1997. Besides Pope Francis, the residence will also host the whole papal entourage, which will number about 40 people. The Pope will visit Brazil’s National Shrine of Our Lady of Aparecida on Wednesday 24 July. It is the largest Marian shrine in the world. A visit to the National Shrine of Aparecida was a personal request of Pope Francis. There, the Pope will venerate an image of Mary in the basilica and, afterwards, will celebrate Mass with Cardinal Raymundo Damasceno (president of the National Conference of Bishops of Brazil, as well as the Archbishop of Aparecida). On Wednesday, Pope Francis will also attend the opening of the “Pólo de Atenção Integrada da Saúde Mental (PAI),” which will provide services for those recovering from drug addiction. On Thursday 25 July, Rio Mayor Eduardo Paes will hand over the keys of the city to the Holy Father, in a symbolic and traditional ceremony. This reflects the respect for the Pope and the authority he represents. In addition, there will be a short meeting with representatives of the sporting world, with the Blessing of the Olympic and Paralympic flags. Pope Francis will also visit a favela in Rio de Janeiro, 33 years after John Paul II visited a favela in another area of the city. Instead of Vidigal in Rio’s South Zone, which John Paul II visited in 1980, Pope Francis visit will visit a favela in the North Zone. The community chosen is Varginha, within the Manguinhos Complex, recently pacified by the Government of the State of Rio de Janeiro. The Pope will speak to residents and give his blessing. At 6pm the Pope will participate in the Welcoming Ceremony on Copacabana Beach, which is one of the Main Events of World Youth Day Rio 2013 (WYD). There the Pope will greet WYD pilgrims for the first time. One of the most visited tourist attractions of the city, a former home of Emperor Dom Pedro, Quinta da Boa Vista, will host the Pope during the morning of Friday 26 July. Afterwards, some young inmates will meet with Pope Francis at the Archbishop’s Palace . At noon, the Pope will pray the Angelus from the central balcony of the palace. Before the traditional “lunch with young people from all continents,” which happens at all WYDs, the Pope will greet the WYD Rio 2013 Local Organizing Committee and the WYD sponsors. The Via Crucis with the youth, which is the third WYD Main Event, will take place at 6pm on Copacabana Beach, and the Pope will give a speech. On Saturday, 27 July the official activities will begin with a Mass at the Catedral São Sebastião in the presence of bishops, priests, and seminarians. Later Pope Francis will meet members of the public at the Teatro Municipal. In the afternoon, the Pope will attend a lunch in the “Centro de Estudos do Sumaré.”with Brazilian cardinals, the president of the National Conference of Bishops of Brazil, the bishops from the State of Rio de Janeiro, as well as the papal entourage. At 7:30pm, the Pope will be at Campus Fidei in Guaratiba for the Prayer Vigil with young people. This is the fourth WYD Main Event. There, he will deliver a speech to pilgrims. At 10am on Sunday, 28 July, Pope Francis will celebrate Mass at Campus Fidei with the youth who will have spent the previous night there. He will announce the next city to host World Youth Day. At noon, he will pray the Angelus with pilgrims. To personally thank the 60,000 volunteers involved in WYD, Pope Francis will meet with them at 5:30pm at Rio Centro, and give a speech. There will be also a farewell ceremony at Rio’s International Airport, where the Pope will make his final speech. His departure to Rome is scheduled for 7pm. This entry was posted in Brazil, Rio de Janeiro and tagged Brazil, Pope Francis, Rio de Janeiro, World Youth Day by Critical Divide. Bookmark the permalink.